Learning is Easier When it is Fun! Everyone knows that you learn better when you are having fun. 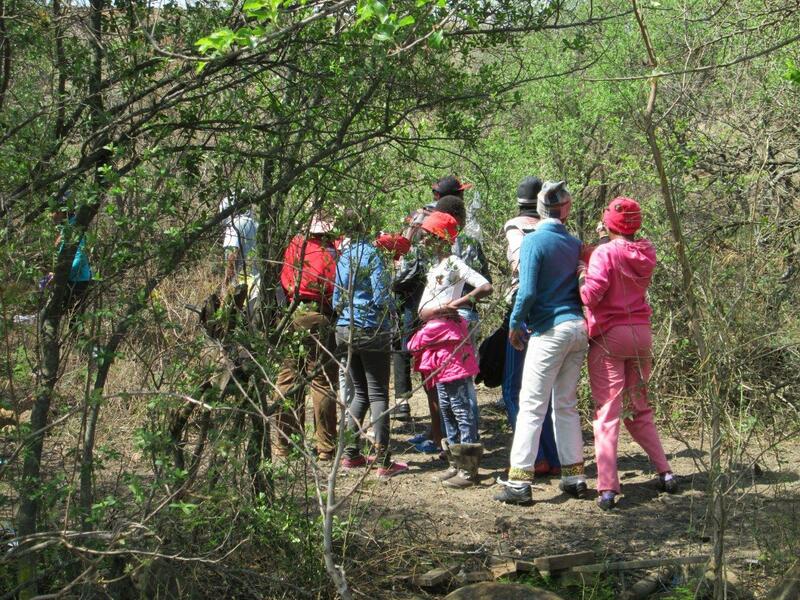 The Mpophomeni Conservation Group also know that there are plenty of opportunities for learning and fun right on their doorstop. As the youngsters headed back to school last week, they had lots of stories to share about the variety of holiday activities organised by the Mpop Kidz Club facilitators Ayanda Lipheyana and Tutu Zuma. 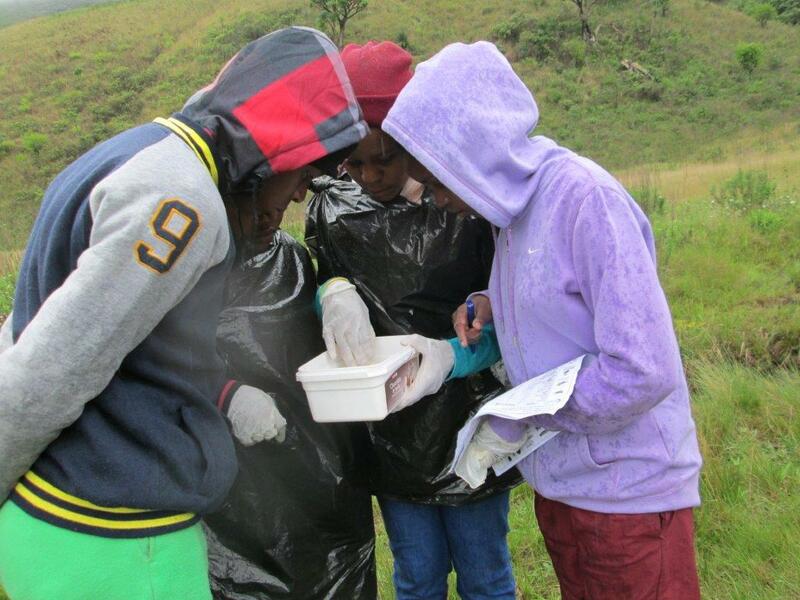 Whenever they suggest a fieldtrip to explore the uMthinzima Stream to do some miniSASS and turbidity tests, a small crowd of enthusiastic youngsters interested in acquiring more knowledge about the environment, arrives. Early in December the younger members of the club learned about river health and the water creatures that indicate good quality water. 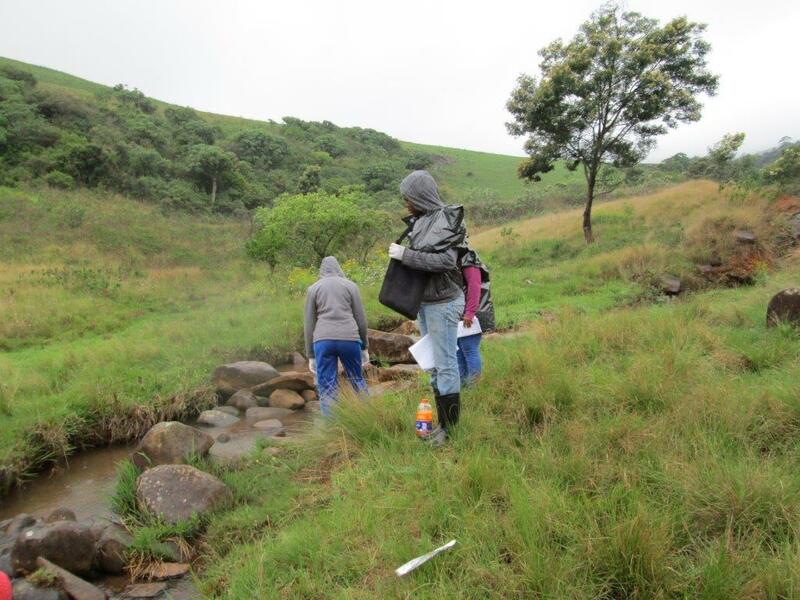 They headed to the uMthinzima stream for a practical session. There was a manhole spilling into the river, so it was too dangerous to get in the water to do a miniSASS, but they did test the water clarity – it was only 3cm! A few days later, a group returned to do some proper mini SASS tests working their way up the stream from the very polluted area behind the Municipal Offices. It was lovely warm day and although it started to rain before we were finished, everyone enjoyed themselves. At the first site they found worms, crabs, bugs and damselflies- a dismal score of 4.25. Further upstream the score improved to 5.2. As we walked, we passed small forest patches and the children took the opportunity to discuss alien plants and indigenous forest. At the third site we found mayflies, damselflies, bugs or beetle and caddisflies. There were lot of stones and fast flowing bubbling water – the stream was largely natural – in a Good condition. At site four we found flatworm, crabs, other mayflies, damselflies, dragonflies, caddis flies and true flies, but the score dropped to 6.5.The water clarity test was 64. 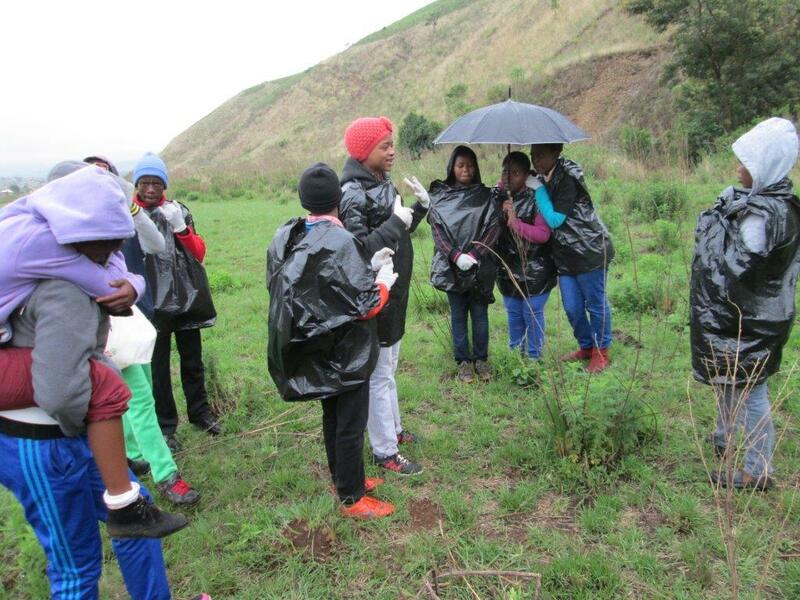 A small group of high school kids trekked across to the Nguga Stream on Goble’s Farm opposite Mpophomeni just before Christmas. During the morning, four children who live nearby were watching us and we called them to join in. The first spot we did a miniSASS test was just below Midmar Crushers. We found flatworms, Minnow mayflies, Damselflies and true flies – a score of only score of 3.5. The turbidity score was high – 50cm. There was a short discussion about what could be the reason for a low MinSASS average score when the water clarity was good? Ayanda explained “The MiniSASS average score shows that the site is in very poor condition and the water clarity score shows that the river condition is not that bad. Better water clarity does not mean water is in natural condition. If we can do MiniSASS in water that we drink from the tap. 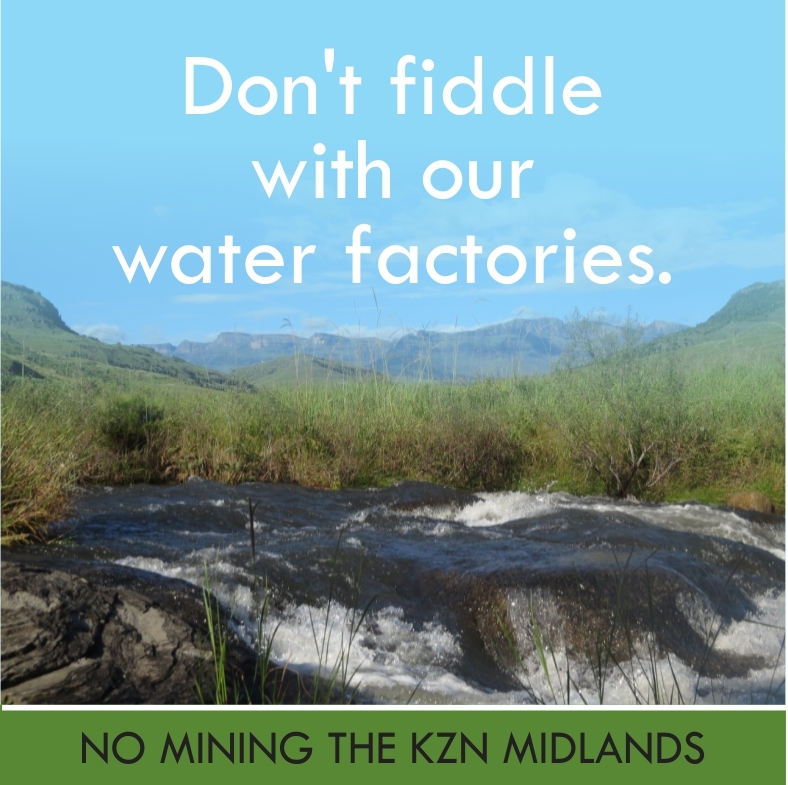 We will find no insect and the MiniSASS score will be zero while the water clarity is 100cm.” Asanda thought it was possible that at Midmar Crushers release some chemicals in the stream that kills insects but does not affect water clarity. Our next site was 100m downstream from the first. The MiniSASS average score improved to 4.25, but the water clarity test decreased from 50cm to 31cm. We noticed that between site1 and site 2 people were washing, children were swimming and cattle passing through the stream. Another 200m downstream we did another water clarity test and we got only 17cm! 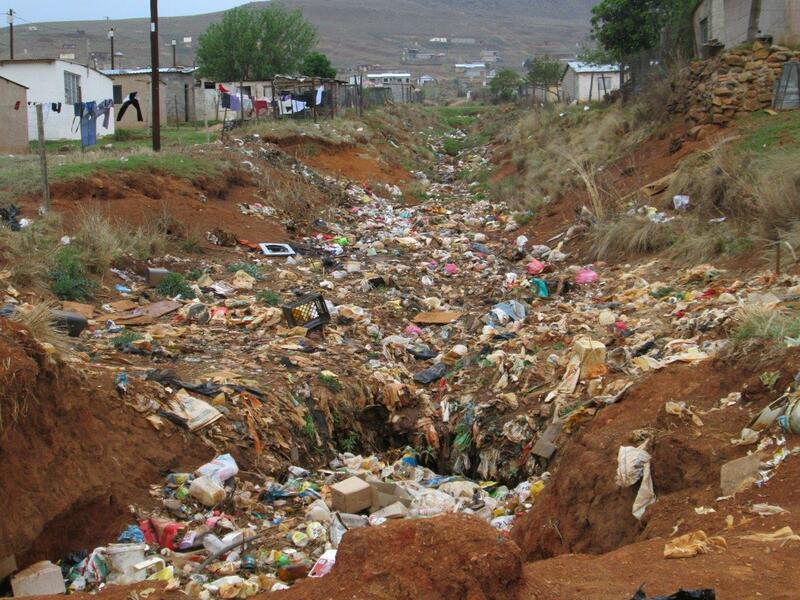 The site is spot where the surrounding community dump their rubbish. 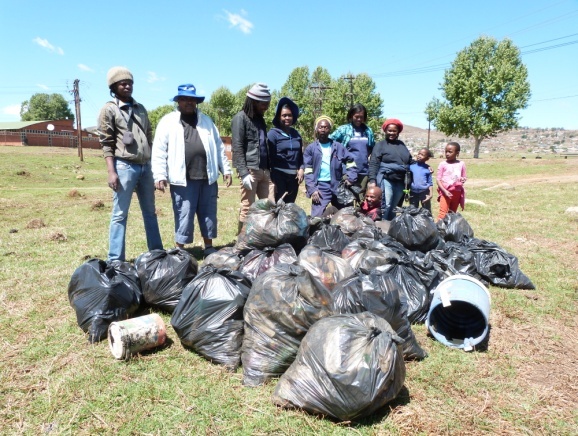 The manager of the area, Doug who joined us, said people are dumping rubbish in the stream because the Municipality does not collect rubbish for Nguga community. He suggested we start a petition and forward it to the counsellors or municipality authorities. As we walked we saw 2 dead goats in the stream and a leaking manhole. However, the sewage does not go straight into the stream, it spreads over the land and has formed a ‘sewage wetland’ near the stream. The MiniSASS test we conducted here was 3.8 and the water clarity has improved to 31cm We thought that the leaking manhole was not affecting the stream that much. Everyone enjoyed exploring a new stream and had fun making things from the clay on the banks. Early in January the MCG trailed across to the forested area near Nguga stream to learn about trees. In groups they identified 12 indigenous species and discussed the functions of each tree using the Sharenet Forest Community Handbook. They repeated the exercise in a plantation nearby and found only five species. They surprised a group of kids swimming in the stream! Eish, it was HOT! Learners were given the pictures of a puzzle of environmental issues around rivers that they had to fix. They gave feedback on what is wrong and how they did fix it. 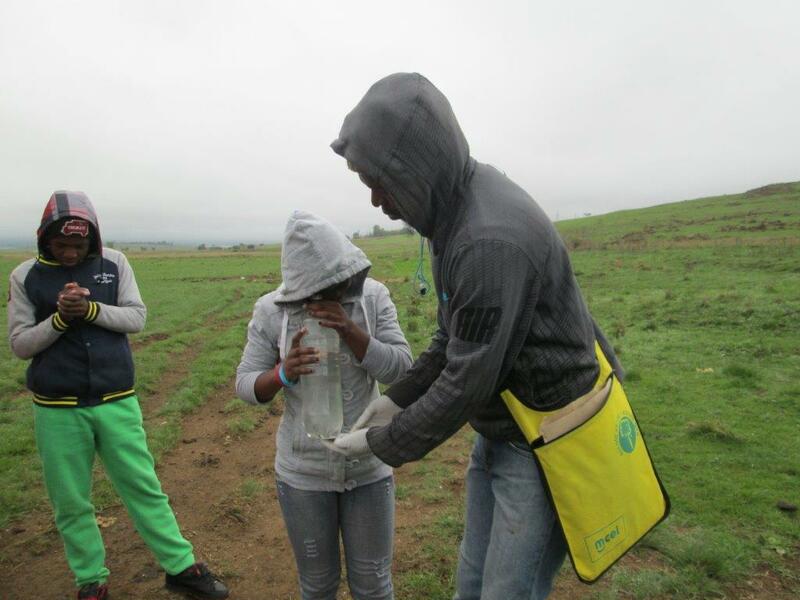 From the forest to the grassland – our next outing was up the hills that surround Mpophomeni to conduct a grassland study. We wanted to compare the grasses at the top of the hill and at the bottom. We were hoping to find more species at the top. As we walked, participants remembered other times they had been up the hills. Bulelani Ngobese remembered that way back in 2009 he left his red cap on top while having a picnic and wondered if he would find it again! On top each group collected different species of grasses within a 9 metre square area for 15 minutes, then spent time identifying the different species using the Grasses of SA guide. We found 15 species of grasses but couldn’t identify all the species. We did identify thatching grass, red grass, brown needle grass, bristle grass and spear grass and discusses the functions of grasses and whether or not each species was palatable to cattle. We had a picnic of apples, eggs and fresh, cold water before heading back down the hill. At the bottom in the disturbed area we only managed to find 7 species of grass. We were all happy to conclude that our assumption was correct – we did find more species at the top of the mountain than at the bottom of the mountain. 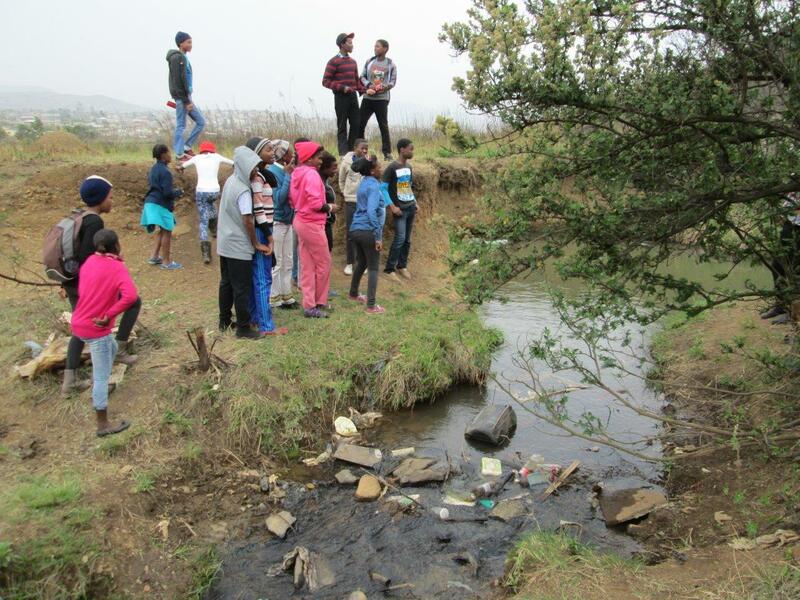 Children from Ethembeni Family Centre are keen to adopt part of the uMthinzima stream that is only 50m away, to keep the banks free of litter and monitor the condition of the water. The purpose of this excursion was to introduce the 22 kids and 4 adults to mini SASS. We walked from Mpophomeni Library to uMthunzima stream behind the Municipality offices near the sewage pumping station to do the first test. We found flatworm, redworm, damselflies, bugs, beetles and snails, the river is in very poor condition. The water clarity was only 9.00cm. It took about an hour to walk to the second site. Along the way we saw some indigenous trees. 10 year old, Anele Mgadi said”Ngiyasikhumbula lesi sihlahla umama wethu uSofe usake waifundisa ngaso e-centre.” Then she thought for a while and said “umlahlankosi usetshenziselwa amadlozi.” Ziziphus mucronata or Buffalo Thorn. We should make sure that we keep the manholes clean so that we can drink clean water. We found a leaking stamkoko 3 years siqalile so that means 3 years makaka engena emanzini! We do not to have throw rubbish in the river, we can make many things with rubbish by recycling. We found some stones, we found some small insect living under small stones. Sabona isitamukoko sokugcina esingena emanzini uma ufuna ubhukuda. Bhukuda ngenhla kwaso not ngenzansi. We walked along the banks for another two hours passing some children swimming. In the clean clear water Nhlaka found a stonefly! “Look what I found. I found a big one.” He shouted, with no idea how exciting his find was. Our miniSASS score here was 9. For the very last excursion of the holidays, the kids asked if they could walk along the uMthinzima again to the top where the water is clean. 38 youngsters aged 8 to 19 and four adults joined in the river walk! They will be monitoring the stream at once a month and conducting regular clean-ups along the banks of the stream. As expected, the river behind Municipal offices near the sewage pumping station gave us a very low score of 3.8. The water clarity was 6cm. We walked for the next three hours, not dawdling too much as the kids were keen to swim in the clean water at the top. We passed some other kids swimming along the way. 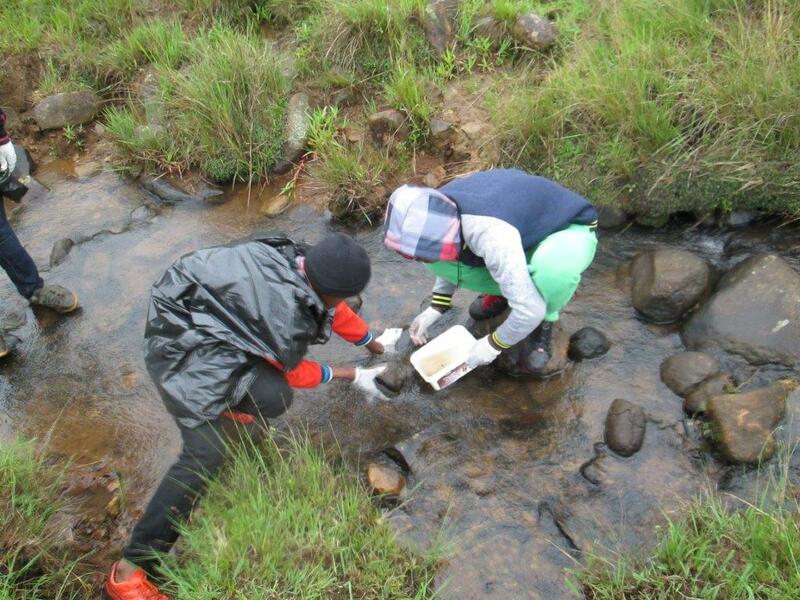 Near the source of the stream, where it is natural condition, we found crabs, flatworm, snail, dragonfly, other mayflies, damselfly, bugs and beetle and caddisflies – a super score of 8. The water clarity was an amazing 97cm – what a difference from only 6cm further down! 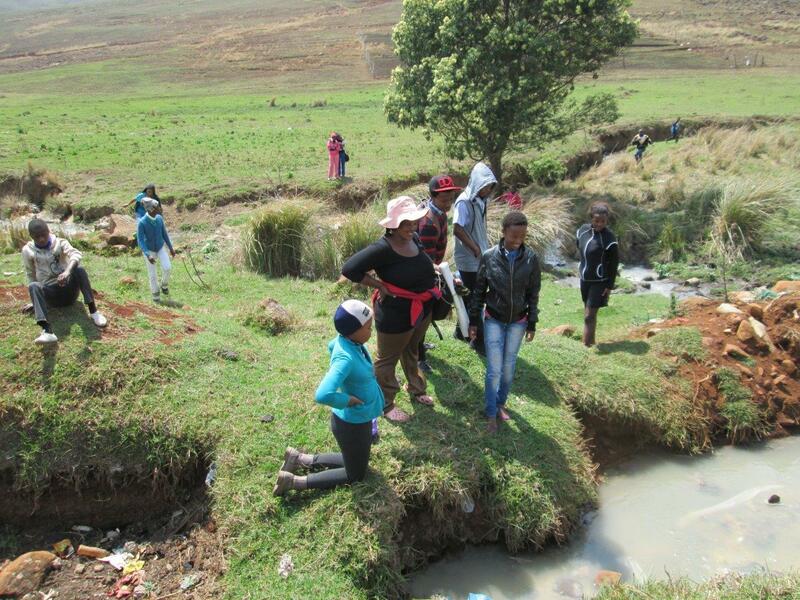 Everyone was happy to see clean water in uMthunzima stream and had fun exploring and splashing. We explored the forested area on each side of the stream. It was lovely and cool. To conclude the day we used a picture building game. On one side the river is polluted while on the other side was in natural condition. All the kids were given different coloured crabs. Red crab (no life or poor condition), green crab (natural condition), purple crab (poor condition) and had to put the crabs into the poster where they think they belong. Now that’s a lot of lekker, local holiday activities! Thank you N3TC for supporting the Mpop Kidz Club. 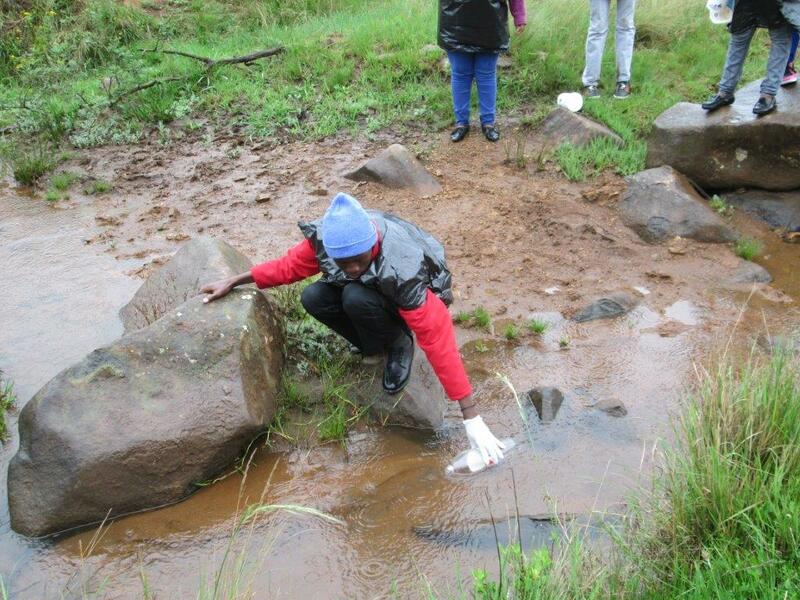 This entry was posted in Environmental Learning and tagged miniSASS, Mpop Kidz Club, mpophomeni, Mpophomeni Conservation Group, Nguga stream, turbidity test, uMthinzima on January 28, 2015 by Midlands Conservancies Forum.